Harriman state park is an amazing place to be this time of the year. Between rising trout and bugling bull elk, I can’t think of a better place on earth to be. The mornings have been solid with what I like to call “bug Soup”. Bug soup consist of a plethora of bugs on the water. It’s cool to see but can make fishing a little difficult as you have to sort through multiple flies to figure out what they are eating. The soup on Saturday consisted of pmds, tricos and callibaetis. 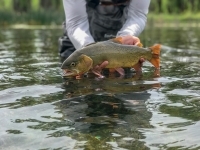 The other problem with bug soup is it seems every fish in the river is up feeding so hunting that “big one” can be difficult. I will tell you, don’t keep casting the same fly over and over to him. Change your game up a little. Un-matching the hatch sometimes works. Fishing a fly a size larger will also sometimes fool a fish. Lastly try timing his rise. If you can have your fly over him when he rises you may just get lucky. There are a ton of hoppers around this year. Watch the banks close. There are some very large trout sitting right next to the bank waiting for a clumsy hopper to fall in. Take advantage of the windy days. When the wind is ripping, hoppers are falling in the water! Flows in the box are down around 400 cfs and will probably remain so for a while. Stick with the usual in the box. Small beads and rubber legs will do the trick. I like a #16 red zebra with a #10 black rubber legs. This is also a good time of the year to streamers. Hoppers are also a good call. I like the near a nuff hopper and the sweet grass hopper. 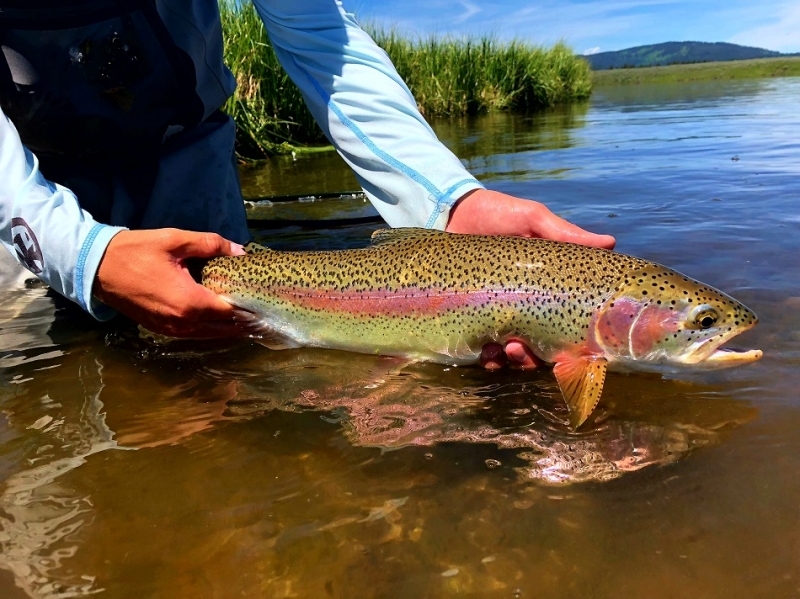 The lower Henry’s Fork has really been fishing well. 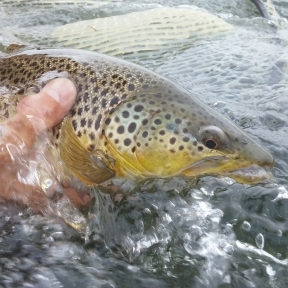 There are some blue wings around and on the warm mornings the trico fishing has been very good. I don’t have to tell you about the hoppers on the lower river. They are thick! You could just fish a hopper dropper combination all day and be very successful. Don’t forget to have some Mahoganies with you. Streamer fishing is also starting to improve. If you have ever thought about getting into the trout spey game the lower Henry’s Fork has some amazing runs. A 20 inch brown trout on a 13 foot 3 weight rod can be a ton of fun. The South Fork is a great choice this time of the year. Again you can’t go wrong with a hopper. The mutant stones are still around and there are some mahoganies around. If you’re planning a trip in that direction make sure you have a good selection of streamers with you. It’s getting to be that time of the year. I would focus efforts in the canyon and on the lower river. 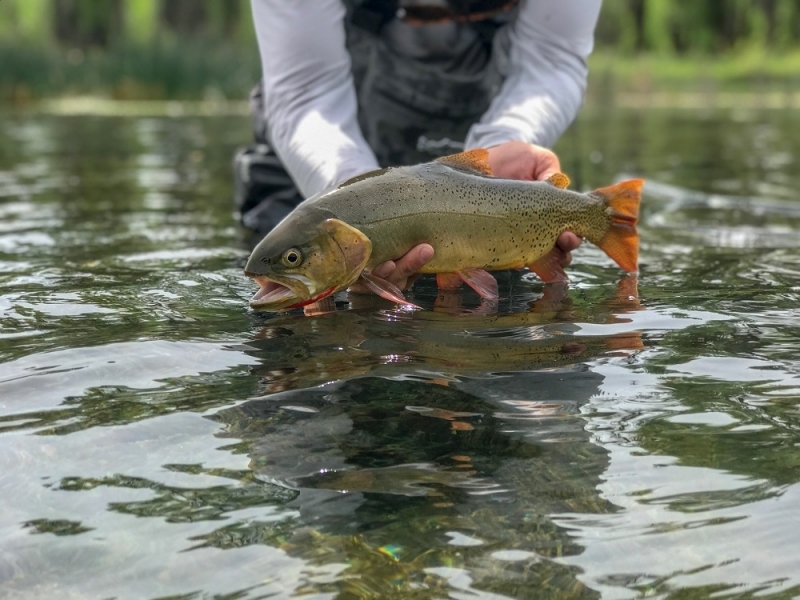 Hoppers and ants continue to be the best option throughout the upper river, but you’ll want to adjust your color and size accordingly as it has been changing a bit every day. Tan, pink, gold, and flesh colored hopper patterns are all good options right now and we have been doing best on small to medium sized imitations in the wade stretch down to Palisades. That said, they seem to be looking for a little extra protein downstream from Pal where 8’s and 10’s have been receiving a little more attention. Ants have also been picking up some good fish, whether used as a dropper behind the hopper or fished as a single dry. Cinnamon ants are always good choices this time of year. I would say we are getting close to shutting the books on another season of gulper fishing on Hebgen. There are still some bugs around later in the morning but things are slowing down for sure. No rush to be on the water first thing. If the bugs go it will be later in the morning. A lake that supposedly does not have any fish left in it, we sure have been very successful on Henry’s Lake. A lot of smiling faces in the shop at the end of the day. Fish in the 10 to 15 pound range have been coming out of the lake almost daily. I would have leech patters and bead heads for Henry’s Lake. Scuds are also a good call.